Markov decision processes (MDPs) are an elegant and exact way to formulate dynamic decision problems. The solution methods for MDPs, however, suffer from the curse of dimensionality. As a consequence, most problems of realistic size are too large to solve as a MDP. The linear programming approach to approximate dynamic programming is a relatively new technique in operations research. The underlying idea is to approximate the solution of a MDP in order to obtain bounds and theoretically founded heuristics for the problem at hand. In this talk, I will introduce the main ideas of ADP and illustrate its usefulness in a variety of examples including revenue management and patient admission in healthcare. 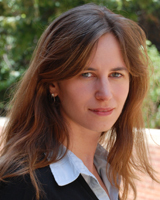 Christiane Barz is an assistant professor of the Decisions, Operations & Technology Management group. Prior to joining UCLA Anderson, she spent two years as a postdoctoral researcher with the Operations Management group at the Chicago Booth School of Business. Professor Barz holds a doctorate degree and a diploma in industrial engineering from the University of Karlsruhe, Germany. Her main research interests are revenue management, dynamic pricing, healthcare services, inventory theory, and production scheduling. In her dissertation, she analyzed the impact of an airline’s risk-attitude on the availability of low-cost tickets. The thesis was published in the Springer Lecture Notes in Economics and Mathematical Systems and won several prizes including the dissertation prize of the German Operations Research Society 2007. Recent projects focus on the solution of large-scale dynamic optimization problems using approximate dynamic programming techniques. She applies these methods in production scheduling and healthcare applications. Christiane Barz teaches "Data and Decisions" in the Full Time MBA Program and "Applied Stochastic Processes" in the PhD Program and "Data Analysis and Management Decisions" in the Global Executive MBA Program for the Americas. Her teaching was recognized by the George Robbins Assistant Professor Teaching Award in 2012.